Curry broke the NBA record for threes this year in both the regular season and the playoffs. A year ago, the world-champion San Antonio Spurs were heralded as the ultimate expression of team basketball, the perfect foil for the superstar-driven Miami Heat team that they defeated soundly in the NBA Finals. The Spurs deployed spacing, misdirection, pace, and ball movement to get layups and copious open looks from outside. Similar offenses installed this year in Atlanta and Oakland from disciples of Spurs Head Coach Gregg Popovich helped make the Hawks and the Warriors the two best offenses of the 2014–15 season. That celebrated Spurs team averaged 105.4 points and eclipsed 30 team assists in 16 games last year. This year, there's a new gold standard for team offense. Call it the Blue-and-Gold standard. The Golden State Warriors dwarfed last year's champion in both categories, averaging a league high 110 points a game and notching more than 30 assists 28 times. And there's more eye-popping offense from where that came from. Golden State also led the league in assists, fast-break points, and topped the NBA in point differential — at more than 10 a game — becoming just the eighth team in league history to outscore opponents by double-digits over an entire season. Their point differential at home (+14.6) was a full five points larger than the next best team (San Antonio's +9.6). Since the league started tracking lineups in 1970, only one team has a better winning percentage with its starting five intact, the 1995–96 Chicago Bulls, generally regarded as the best ever. "The Warriors have the fastest pace in the NBA, the best shooting team, the most assists, the best three-point shooting, and the best field goal percentage," Warriors TV play-by-play man Bob Fitzgerald told NBC Sports Radio. "That really hasn't happened [before]." Another unprecedented offensive leap borders on revolutionary: the way in which the Warriors convert fast-break opportunities into wide-open threes. Yet the cliché remains: Defense wins championships. And every Warrior player and coach echoes a defense-first attitude. "It's what starts our offense," said center Andrew Bogut, an All-NBA second team defender. "We're the best defensive team in the league," defensive Player of the Year runner-up Draymond Green reminds reporters regularly. "Have been all year." But it wasn't defense that won hearts across the country — among basketball fans and non-fans alike. And it wasn't Stephen Curry's career-high two steals a game that earned him more All-Star votes than any other player. No, the mesmerizing reel of his top ten plays of the year involves buzzer-beaters, no-look backward bounce passes, behind-the-back buckets, and ankle-breaking crossovers — and no blocks or picks. What makes his baby face ubiquitous is not so much his dramatically improved defense but something closer to the fact he routinely makes 85 of 100 threes after practice. It means that the 1980s "Showtime" Lakers are no longer the most entertaining team to make the NBA Finals, which start on Thursday, June 4, against the Cleveland Cavaliers at Oracle Arena — and mark the first time in forty years the Dubs have qualified. "Cleveland fans know this as well as anyone: There is something unique about watching an all-time great," Bay Area News Group columnist Marcus Thompson wrote. "There is another level of viewing pleasure when you know what you are watching is something most people don't get to see." The elements that go into the NBA's most electric offense range from strategic to kinetic. 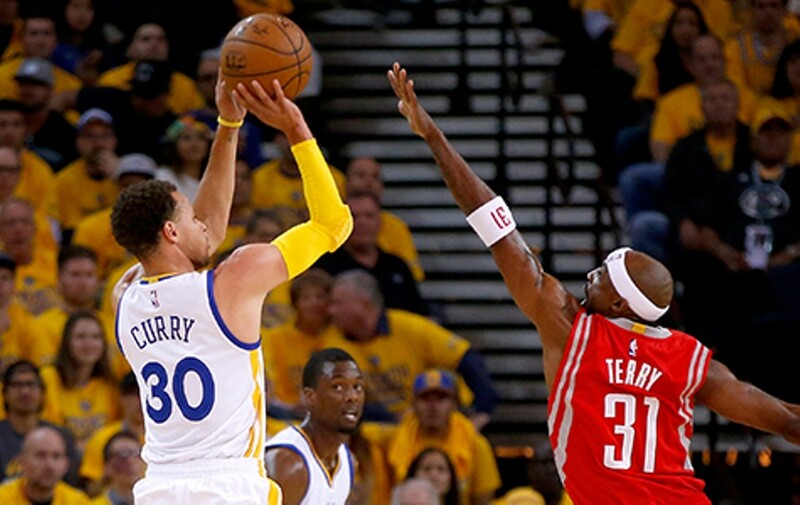 The most eye-catching piece: Golden State's other-worldly three-point shooting. Klay Thompson shot a sizzling 43.9 percent from distance on his way to 239 threes during the regular season. The only player to make more? Fellow Splash Brother Steph Curry, who broke his own record in a season, draining 286 from downtown, and then quickly claimed the most (73 so far) in a postseason, too. "Two of the greatest shooters the game has seen," the Cavs LeBron James recently told reporters. But there's more at work here: Sports analysis hub PointAfter endeavored to rank history's 25 best teams in three-point shooting. Last year's Spurs finished seventh. This year's Warriors finished second all-time, besting teams like world champion 2012-13 Miami Heat with Shane Battier (43 percent), Ray Allen (41.9), Mike Miller (41.7), Mario Chalmers (40.9) and James, who had his best season from beyond the arc (40.6). The only team better than the 2014–15 Ws was the 2009-10 Phoenix Suns, coached by current (and soon to be former) Warriors associate head coach and offensive guru Alvin Gentry. (He'll leave for the New Orleans Pelicans head gig after the playoffs.) His GM in Phoenix? Current Warriors Head Coach Steve Kerr, himself a three-point sharpshooter on teams that won five NBA titles. Kerr and Gentry understand that more three-point attempts are well worth the risk, given the bigger payoff: Incorporating the extra point per attempt, Curry would have the second highest field-goal percentage in the league after only dunk specialist DeAndre Jordan. 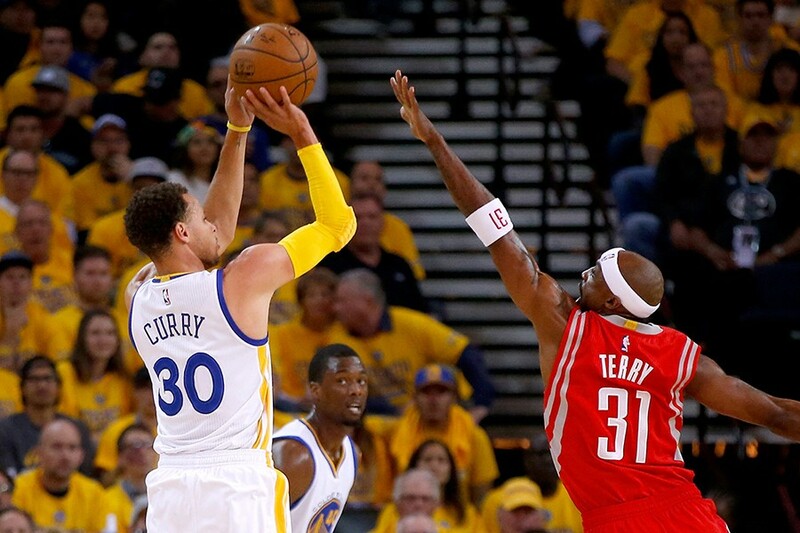 "[Curry] provides even more bang for the buck than his larger fellow stars," Thompson wrote. "He can change a game faster than anyone, rack up points like few else can." That explosiveness definitely enters into Golden State effectiveness and appeal. Their playoff comebacks — from down 20 to the Pelicans in the fourth — merely kept with a season-long pattern of resilience that included overcoming deficits of 26 and 20 during the regular season. The team's secret sauce also includes Xs and Os. Former head coach Mark Jackson preferred to isolate players like Thompson and David Lee in half-court sets that choked off movement. But Kerr and Gentry prioritize ball movement, early passes, and bringing Curry off screens — twice as many as last year. Thompson has the greenlight to drive more aggressively, taking it to the hole 4.1 times a game compared to 2.8 in Jackson's last year. Curry and Thompson both get significantly more touches, as does Bogut. "Andrew's one of the best passing centers in the league," Kerr said before the season. "He's one of the best I've ever seen, and so for us to get him the ball on the elbows as a dribble-handoff guy, backdoor-pass guy — that will be emphasized." Kerr also loves a small lineup late in games with five players no taller than 6-feet-8-inches — tallest to shortest: Harrison Barnes, Green, Andre Iguodala, Thompson, and Curry — but as quick, athletic, versatile, and active as they come. Suddenly, the offense has five ball-handlers, as many strong scoring options and supreme switchability on defense that neutralizes screens. Team cohesion represents a final — and major — factor. While Western Conference Finals opponent Houston Rockets started four free agent signees and a midseason waiver pickup and the Cavaliers start just one player who's been with them his entire career, Golden State opens the game with four players that the team drafted. In fact, the Ws extinguished the Rockets in Game 5 with three players from a single draft — 2013's class of Barnes, Green, and Festus Ezeli — on the floor. Warriors color commentator Jim Barnett observed what that means on SiriusXM. "You can't buy chemistry," he said. "They're the most unselfish team in the league." Curry later elaborated. "It's huge," he said. "We've learned a lot over the last few years together. We know each other very well, what to expect when we get on the floor. We rely on that chemistry and sense of unity. To get you where you want to go, and that's a championship, you need it, and now we're on the cusp."